Primitive camp decorations on Big Munson, originally uploaded by Tom Watson. For the five days we were on Big Munson Island, separated from smart phones and the never-ending tidal wave of digital information, the wind blew from the east, along the Straits of Florida between Cuba and the Keys. Sometimes it was a light breeze, just enough to stir the leaves and keep the bugs at bay. 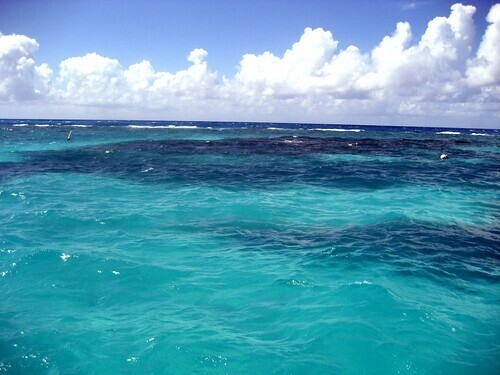 Many times, it was a full-on gale, flipping the hammocks around and stirring up six-foot seas beyond the reef. And always, the wind was a constant soundtrack, replacing the one that usually flows from small devices into little white earbuds. The only organized music was of the group camp song variety. Yet, the wind was always welcome. It kept the tropical temperatures down and even the smallest of insects didn't bother us. And it did something else, at least for me: it provided a kind of constant reminder that the only information we needed to react to was related to the weather, to the tides, and to each other. No one did the chronic idiot's walk-and-tap of the Blackberry and iPhone addicted all week. Rather, we looked around and judged our circumstances and surroundings imply by what we saw, what we heard, what we smelled, and what we touched. This is no small thing, especially to someone who's been addicted to that digital stream of consciousness now for a good 15 years. What I found was that interruptions were few and mostly worth paying attention to. That conversations matter - the spoken kind, the face-to-face genus of the species. And that our human senses became - literally overnight - more taut, more sharply set and more useful. Yet there was some communication with the world outside (and I don't mean the senior counselors' lone shortwave radio in the HQ tent for emergencies). No, the sea provided. There was the label on the empty shampoo bottle from Jamaica, the writing on the detergent bottle from the Bahamas. Based on its position at the top of the Caribbean and to the west, the barrier islands on the southern side of the Keys receive all manner of interesting human junk. Like the bottle from Cuba that one of the scouts found: transparent green and containing 22 Cuban dollars and the small photo of a young man in his twenties. Was it a funeral offering? Or the hopeful harbinger of someone beginning a journey to a new life? There was no way to tell, yet we discussed the possibilities late into the night. It was a short message from the sea, far more powerful than any Twitter message I've ever read, speed-scanning 140-character posts like a maniac back in civilization. Indeed, this was social media - not just the mysterious bottle, but the collective stories on the island: the hilarious skits put on by the guides, the stories around the fire each evening, the fish tales from the fishing trip. And the little decorations that appear and the entrance to each inland campsite on Big Munson. 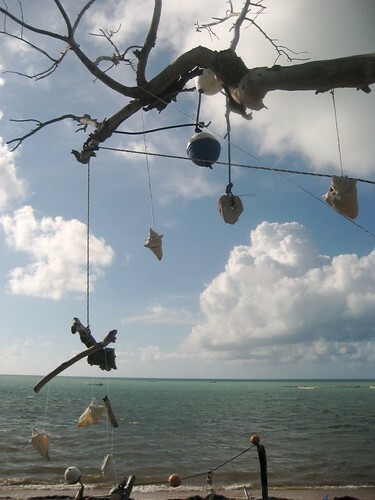 Conch shells by the dozen, colorful lobster pot floats, bits of flotsam and the occasional hunk of rock or coral - all hung with nylon boating lines, also washed ashore. We added to our site's "front yard" during the week and enjoyed the exterior decorating in the evenings as we looked toward distant lightning storms in the southern sea. And all the while, the wind made the ornaments turn slowly, in the slow syncopated rhythm that can only appreciated by the totally unwired. Looe Key waters near the reef, originally uploaded by Tom Watson. In Post Captain, the second of Patrick O'Brian's twenty volumes of nautical Napoleonic adventure, a trepidatious Stephen Maturin points to a shark as he and his friend Jack Aubrey are swimming in southern seas. Maturin is decidedly a creature of the land, the Irish-Catalan surgeon and spy, and a great natural philosopher endlessly curious about the species he finds in his travels with the Royal Navy. Aubrey, of course, is a man of the sea, living in wooden hulls from an early age and entirely at home with salt and tide and weather. And he is entirely dismissive of the shark that stirs the fears of Maturin, who in other instances in the series proves himself a fearless killer. "Him?," says Aubrey. "Oh, sharks are mostly gammon, you know: all cry and no wool." No wool indeed. Last year, there were four fatal shark attacks worldwide, according to the Florida Museum of Natural History. Four. And only 59 confirmed unprovoked attacks of human beings by sharks, around the world. Yet, each year the hype of Discovery's Shark Week throws more blood in the water and continues to position the shark as man's deadliest enemy at sea. Lightning kills far more people than sharks; there have been 27 deaths this year in the United States alone, and many hundreds of injuries. If sharks had killed 27 Americans this year, you can only imagine the wall-to-wall media coverage we'd all be submerged under. The truth is, grisly and dramatic death in the jaws of an oceanic killer is just scarier than the more common demise from a bolt from above. I think it's because when we swim in the sea, we're conscious of entering a huge domain that is inherently not our own. Last week on our out island adventure, I had no opportunity to Google for shark attack statistics or lightning deaths; I couldn't ask the Twitterverse, either. Blackberries and iPhones were strictly banned. Like the rest of the crew, I just had to get along and face my fears. And of the two, lightning's always been the scarier. And on the first day of the encampment, we had plenty; the southern tip of a tropical depression that slammed Tampa whipped across Munson Island for a few hours with plenty of bang and flash. My lightning-phobia is well known to family and friends. I think it stems from the random violence of it all; I don't think I'd do particularly well in an artillery bombardment, either. And there were the incidences in childhood: the house set afire (soon doused by rain), the television set that blew in a cloud of gray smoke, the surfer we knew down at the shore who was killed walking off the beach. Random violence from the sky. Yet, there we were - there I was - outside, under dark skies with lightning crashing around the island. Out on the reef, the sight of the shark - an the sure knowledge that there were plenty around - simply didn't raise any alarms. Part of it was the Aubrey-like assurance of our guides. Sharks simply didn't pose much danger. And part of it was that Maturin-like inquisitiveness. I wanted to see a shark. As we dove on Looe Key - the third-most dived site in the world -the underwater world above the coral was stunning. My son and I saw a three-foot barracuda slip past just a few feet away. And when my diving partner Ben signaled to me that he'd seen a big shark, I turned a saw the back-end gliding by, its huge caudal fin moving like a tropical fan. Perhaps an 11- or 12-foot reef shark. And the only shark I saw, except for the three-foot nurse shark I paddled by in the ocean kayak. And while it was an electrifying moment for this nautical novice, it wasn't particularly scary. We'd been out to the floating docks (walking through neck-deep water) to fish for sharks earlier in the week, using chum to salt the waters. Nary a bite, but there were a few jokes as we jumped into the chum slick to walk back to shore. And there was the near-blind night dive as well, with occasional Benchley-like thoughts of evening attacks. In truth, we were always in the water - and the water in the Florida Keys is home to many sharks. But the last confirmed fatal shark attack in the Keys happened in 1952, and researchers have counted only unprovoked shark attacks there since 1882. So it's rare, indeed. After we saw the shark on Looe Key, we took a break in the beautiful 50-foot dive boat owned by the scouts. The boys ran through an hour of diving and jumping contests from the boat. Then we put the gear back on and went for a second look at the coral and all the colorful fish.The diving spot got its name from the HMS Looe which ran aground there in 1744 while towing a captured French ship, the Snow. We didn't see any sharks or shipwrecks, just yellowtail, angelfish, parrotfish, barracuda, and sergeant majors - all in a world that's not our own. Big Munson Island trees and brush, originally uploaded by Tom Watson. During our short week on Big Munson Island, the time we spent outside of the water's realm was passed in the thin shade of a tropical hardwood canopy - or "hammock" in the local parlance. The trees were low and scrubby, a bit like the coastal forests of south Jersey and eastern Maryland in scale, but with different species: gumbo limbo, mahogany, and the infamous poisonwood trees. A relative of the poison oak, poisonwood, we were told many times, packs ten times the stinging wallop of poison ivy and can be inflicted not just on contact but by rain dripping from his five-leaved branches. Of course, there was one just outside my tent near the dead tree I tied my nylon hammock to; yet we managed to avoid the scourge. There were no palm trees on Big Munson that I saw - despite their prevalence in developed areas, they're non-native to the Keys. I was struck by the non-resort feel of the out island, very different than any other Florida landscape, especially the winding dead trees against the sky and the mangroves - busy as they were creating even more island. The Keys were separated by narrow and tortuous channels, from the surface of the clear waters of which were reflected the dark mangroves, on the branches of which whole colonies of Cormorants had already built their nests, and were sitting on their eggs. There were many thousands of these birds, and every tree bore a greater or less number of their nests, some five or six, others as many as ten. The leaves, branches, and stems of the trees, were in a manner whitewashed with their dung. Audubon also thought that the Cormorants of the Keys were specific to Florida, that they differed from those he'd observed (and shot) farther up in the mainland of the young United States. Audubon spent a great deal of time in the Keys among the birds, and during our five days off the grid among the mangroves, I can see why. It's a unique and somewhat fragile ecoystem, yet the lower Keys support such as wide variety of wildlife that it's nearly impossible to tote up in a life time. Our scout guides had excellent memories, however, and they soon introduced us to the vast open zoological park at out grimy feet. The physic-nuts proved of excellent quality, the puffin the true Branco puffin and not, as Stephen had feared, a cormorant or gull. A splendid acquisition, though in so advanced a state of decomposition that it was obliged to be hurried back to the ship before it would fall apart. After a brief tour of his patients and word with Martin, he took the bird into his cabin, wrote an exact description of its plumage and outward members in his journal, and then, gasping at the stench, clapped it into spirits of wine for a later dissection. O'Brian was clearly inventing; even this non-birder knows a Puffin looks nothing like a Cormorant - that the two could hardly be confused. I suspect the great writer merely liked the sound of the words. My own voyage (via JetBlue and the rented van, rather than deal old Surprise) allowed for far less leisurely consideration of the winged fellowship in the waters around Summerland Key and Big Munson Island. But I did jot a few notes in the journal, that I later checked back at the scout base to identify a few species: the elegant Frigate Bird in flight over the ways, the small Wilson's Plovers, the Great Egret, the Little Blue Heron, the brilliant little Red-Winged Blackbird (always in the low trees around the camp like little lanterns), and the ubiquitous Ring-billed and Laughing Gulls. But it was that Cormorant that got my attention as we rowed in from the island in those hard-to-handle war canoes; there in the shallows between a channel and the outer reef, one of them swam by the boat and dove repeatedly for fish. It wasn't particularly elegant in motion. There was no poetry in the movement. He was a working bird, fishing for dinner. A grinder. My kind of water bird. A bird for our times. In the dark, our crew of six bobbed like stray lobster pot markers in a five-foot swell a half mile off the shore of the barrier island where we camped. The waves were whipped up by a strong wind moving westward along the Straits of Florida, 90 miles north of the Cuban shoreline. We wore masks and fins, and carried diving lights but the wind and strong current stirred the sand along the reef and cut visibility underwater to about a foot. Nearby, the Polynesian-style war canoe we'd muscled out from its mooring rolled in the waves. To the east, a thunderstorm rumbled toward us and lightning lit the foaming horizon. No sharks...yet. A more unlikely scenario for this keyboard jockey to find himself in would be difficult to concoct. Yet there I was, wave-tossed and in something approaching peril at sea - and by my own choice at that. Last week, a group of seven scouts and five adult leaders (including my son, my nephew and me) flew to Ft. Lauderdale, rode the 170 or so miles to Summerland Key (about 25 miles up Route 1 from Key West) in a rented van, and the next morning rowed five and half miles out to an "out island." 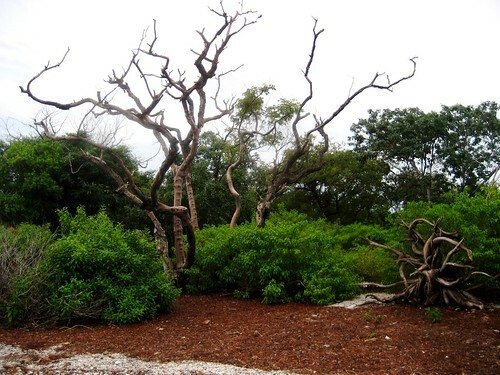 Big Munson Island has no running water and no electricity - just 100 acres of high hardwood hammock fringed in lush mangroves, beribboned on its south coast with thin strands of sand strewn with rotting sargassum. We packed light, under the watchful eye of our island mate - one of the intrepid college students who work summers guiding teens and their dads through Scouting's "high adventure" programs in the Florida Keys. A couple of t-shirts, a pair of shorts, a bathing suit, sunscreen, sandals, a broad hat, and a water bottle were the basics. No towels, no soap, no rain gear, and no electronics of any kind outside of a camera. I managed to get a small camp pillow, a novel, reading light, a lightweight hammock and my pocket journal into the dry bag before we shoved off. Primitive as can be, and that's the idea: tents on the sand, just inside the treeline from the beach. A chuckbox with some freeze-dried and canned provisions - we added fresh fish to that menu via rod and reel. An open fire pit, a canvas rain fly, and big jugs of fresh water the boys retrieved from the floating docks, a couple of hundred yards from shore. Primitive, but controlled. The program was both intense and well-planned, keyed to several real physical challenges over the course of five days - the long pull in the war canoes, deep-sea fishing through six-foot swells in 22-foot open boats, diving for spiny lobsters, kayaking through the inland mangrove maze, night-time fishing for sharks from the floating docks - docks we then had to wade back to shore from through the very chum we'd salted the water with in anticipation of dorsal fins we couldn't see. A brilliant day spent snorkeling on the gorgeous Looe Key, a brilliant coral reef that is the third most dived site in the world. And the night snorkeling trip to Munson Rocks - where we tilted on the edge of panic, but still made it back to the canoes as a group, and raced the storm for shore. There were two sides to the out island challenge for me - the mental challenge of going off the grid and dealing with some my fears (lightning, sharks, heart attack), and the physical challenge of getting into good enough shape to get through the program without letting down the side. As it turned out, dewiring this blogging brain was the easiest part; the grid sailed on without me, and I suspect was better for my absence. I know I was. Time became something governed almost entirely by the sun. Activities and planning reported to their natural nautical superiors, weather and tide. And I just gave in entirely, within hours of setting off from shore. In some ways, the physical part was the most rewarding, especially for this typically hypochondriacal New Yorker in his middle years. The limits are farther out than I thought - in some cases, much further indeed. The combination of pushing past the normal physical limits of laptop calisthenics while facing down some potentially dangerous but exhilarating situations was an absolute tonic. And it was great to see our crew pull together. On the final day, we packed our gear and waded out to the canoes. 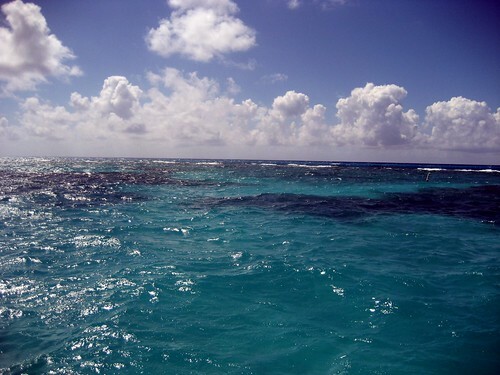 The wind was strong once again, and the seas out by the reef ran pretty high. Already filled with water from the rain storms, the twin hulls took on more water. As we tried to come about and paddle in front of the current, a large wave swamped the war canoe. Suddenly we were sinking, our gear bags floating away, a few hundred yards from shore. Yet there was no panic, no screaming, hardly any real alarm. For an hour, we treaded water and worked with the guys in the outboard skiff to figure out how to refloat the canoes. We worked as a team. And eventually, the canoes were bailed and floated again. We were exhausted, but there was no easy tow back to the scout base on Summerland Key. No, we paddled back, five long miles, shoulders and arms screaming silently, drenched to the skin and sun-burned, singing songs about the Titanic. The grid could wait a couple hours more. This is my final post hereabouts for the next ten days. Early Wednesday morning, I'm heading out for a true adventure off the grid - no Internet, no electricity, no running water, no structures. My son and I are taking part in a "high adventure" Scout trip to an out island in the Florida Keys, about 25 miles east of Key West. We'll be flying down, then taking kayaks across five or so miles of open water to an uninhabited island of about 100 acres off Big Pine Key. It's Robinson Crusoe by way of Survivor with a dash of Gilligan. I'm doing my best to get into the right Stephen Maturin mindset, and to anticipate the varieties of water fowl and briny creatures we'll be seeing. We'll be fishing (for dinner!) 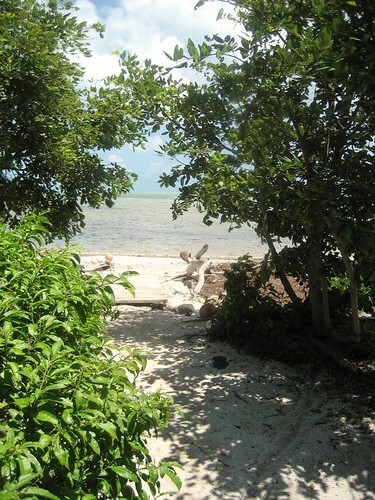 and snorkeling and just exploring most of the time, with a bit of cooking and other camp duties on the island of sand and low mangrove. Sure, that'll be something of a physical challenge; and yes, I've been in something approaching light cardiovascular training the last two months in anticipation of the 95-degree heat. But a big part of this is tossing aside the link to the greater network, a connection I really haven't been without on a daily basis since the Internet became a commercial medium - and even before, if I'm honest. I'll bring a book or two and a journal, of course, but my fingers won't twitch in 140-character bursts and my Facebook trail will grow faintly cool. Weather notwithstanding (I already know I'll have to overcome my somewhat irrational fear of lightning), it'll be that lack of instant communications that may scratch at the door of my sanity. Nonetheless, I'm looking forward to it extremely. So look for my smoke signals on this page in about ten days or so ... if the sharks aren't hungry.